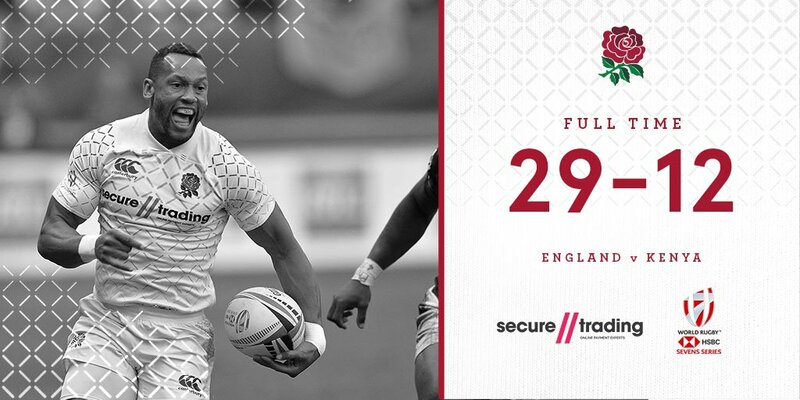 All-time HSBC World Sevens series top tries scorer Dan Norton bagged a hat-trick as England beat Kenya 7s 29-12 in their first match of Cape Town 7s on Saturday in South Africa. Phil Burgess and Ethan were also on the scoresheet for England as Leonard Mugaisi and Cyprian Kuto scored for Kenya 7s. Kenya is up against Fiji at 3.20pm in their second match with the latter coming at the back of a 50-0 win over France in the first pool C clash in Cape Town. A quick-tap saw England's Davis try to break through but he couldn't buy from another penalty, Ethan Waddleton would. A fantastic strength from Alvin Otieno to reach the 5-metre line was broken by England but Kenya nicely worked across to the right and Cyprian Kuto dart back inside for the try. Despite Kuto keeping hold of the ball after a fumble that went backwards, he handled straight to Alex Davis! England broke to see Dan Norton down the left who was able to sprint for the try line. Kenya was offloading well but couldn't find the space to attack. Eden Agero ran across the field and opened up some, finally, but there was a knock on just after! England kept their 12-7 lead at half-time. Kenya had an advantage off the restart and a break quickly down the left. Good defence from England forced them to recycle... but Kenya did finally break through via Mugaisi. Norton produced another superb moment as he chased hard after his kick over the top, there was a slight juggle but it never felt in doubt that he'd control it to bag a brilliant try and get England back in front. Norton was at it again as England scrum and work the ball to him on the left, and he ducked inside and out of three Kenyan defenders, running the better part of 70 metres to complete his hattrick. Phil Burgess was released in the middle of the Kenyan defence and found a small gap.